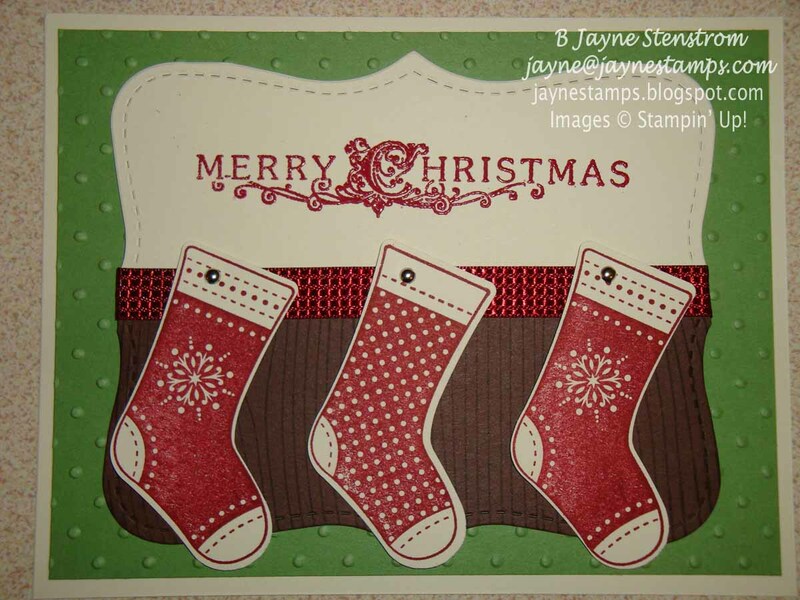 ~ ~ ~Jayne Stamps ~ ~ ~: How about some Stitched Stockings? Are you thinking about your Christmas cards yet? 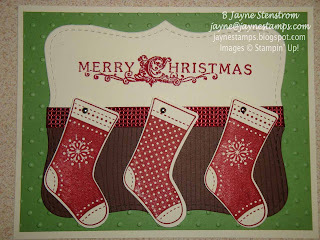 You might want to think about using the new Stitched Stockings stamp set. With the coordinating Stocking Builder Punch, making unique cards is a breeze! The first card I have to show you today was created by my friend Lou Ann Cruttenden. She always makes such classy cards. She used Very Vanilla, Cherry Cobbler, and Wild Wasabi, along with some Chocolate Chip. 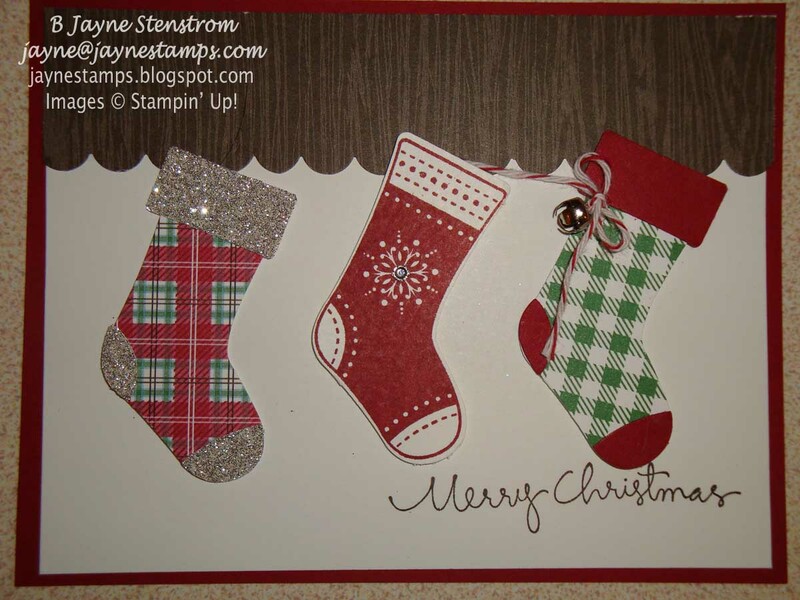 The wood grain look behind the stockings was made with the -- wait for it -- Woodgrain background stamp. The Merry Christmas sentiment is from the Christmas Lodge stamp set and it's embossed with Cherry Cobbler embossing powder. Did you realize that we have embossing powder to coordinate with some of our popular colors like Cherry Cobbler? Well, now you know! Lou Ann also used some of our Cherry Cobbler 3/8" Quilted Satin Ribbon (love it! ), Silver Mini Brads, the Perfect Polka Dots textured impressions embossing folder, and Stampin' Up! 's exclusive Top Note Bigz Die. The second card was created by Georgia Giguere. Her color scheme is almost identical to Lou Ann's except that the green in the Frostwood Lodge DSP is Garden Green. I just love the Merry Christmas greeting she used - it looks like it was hand written, but it's a stamp. It's from the Christmas Greetings stamp set on page 41 of the Idea Book & Catalog. Georgia also added some extras by using the Silver Glimmer Paper, Mini Jingle Bells, Cherry Cobbler/White Baker's Twine, and Basic Rhinestones. So you can go as fancy or plain as you like with these stockings. They're just so much fun to play with! If you create something with the Stitched Stockings set, I would love to see it!